Virginia in her custom-built 10' x 12' backyard studio. 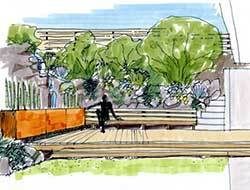 Residential courtyard garden - Conceptual Drawing. 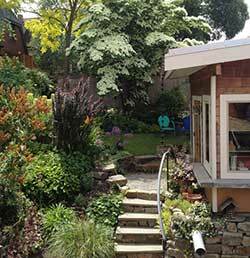 Virginia Hand Design has been building unique and beautiful residential gardens in the Seattle area since 1997. 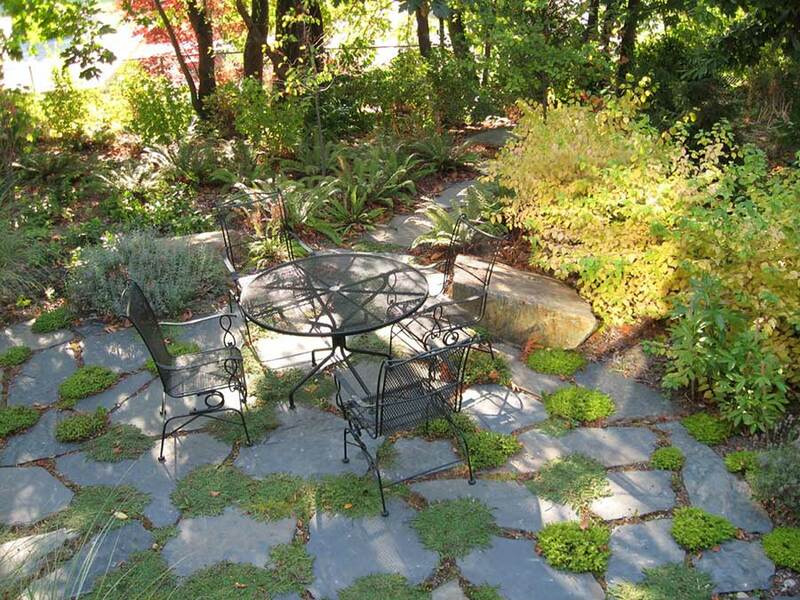 Her landscape clientele is primarily in urban Seattle, with an occasional larger property in the surrounding area. Her client’s gardens, as well as her personal garden, have been included on tours and featured in magazines, books and lectures by writers Julie Moir Messervy, Marty Wingate, Valerie Easton, Debra Prinzing, and Lorene Edwards Forkner. Virginia has a design-only one-person shop, and works in a collaborative way with a talented team of contractors. That spirit of collaboration extends to the clients, resulting in a wide variety of solutions and completed gardens. Virginia has been a member of APLD since 2005 and integrated the APLD logo into a distinctive masthead for the Washington Chapter’s graphic identity. She appreciates the networking, educational, and social opportunities provided by APLD. Born in Ballard, her earliest years were in urban neighborhoods before moving to rural Juanita. There she grew up with the benefits of country living while surrounded by rapidly encroaching suburban development—an early lesson in environment and planning. Her love of the arts led to The Burnley School of Professional Art and a first career in graphic design. Staff positions at KING TV and Parametrix expanded her horizons and were seeds for a client base when she established her own business. Virginia Hand Graphic Design provided corporate design, marketing, identity/logo work and book design. Clients included The 5th Avenue Theatre, King Broadcasting Company, Museum of Northwest Art, Heronswood Nursery, Bloedel Reserve, Mountaineers Books, Sasquatch Books, and Storey Publishing. She continues to do some graphic and book design work. 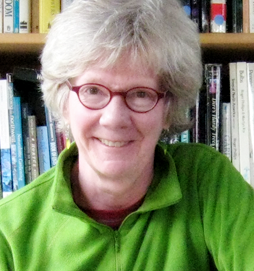 In 1995 the need to move away from the computer screen to a more hands-on form of creativity, combined with a passion for gardening, led her to the ornamental horticulture program at EDCC. On the slow track with evening classes at Edmonds she received a general horticultural education, learned design from Polly Hankins, and connected with other burgeoning professionals. 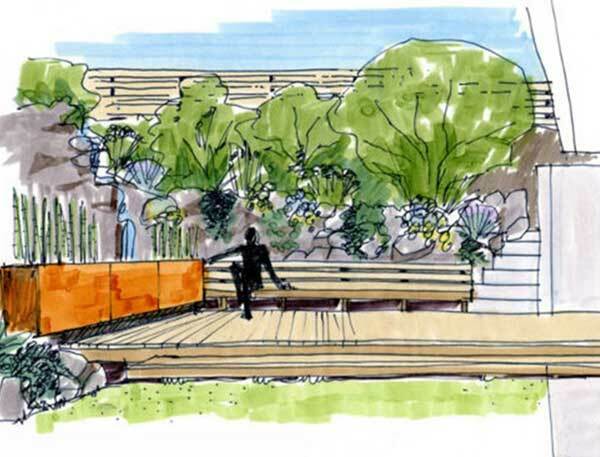 She found that her graphic skills blended well with plants and landscape design. 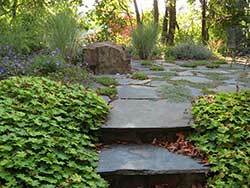 The business name was simplified to Virginia Hand Design and building landscapes became the primary focus. In her free time she plays cajun accordion with her band Troupeau Acadien, who will be performing this year at the NHS Plant Nerd Night. The Native Garden - added native plants seamlessly blend in with the many existing trees in the new Native Garden. View from the basement to the backyard broken flagstone patio. View of the broken flagstone patio from back deck. This house was the first green-built project by Lindal Cedar Homes. 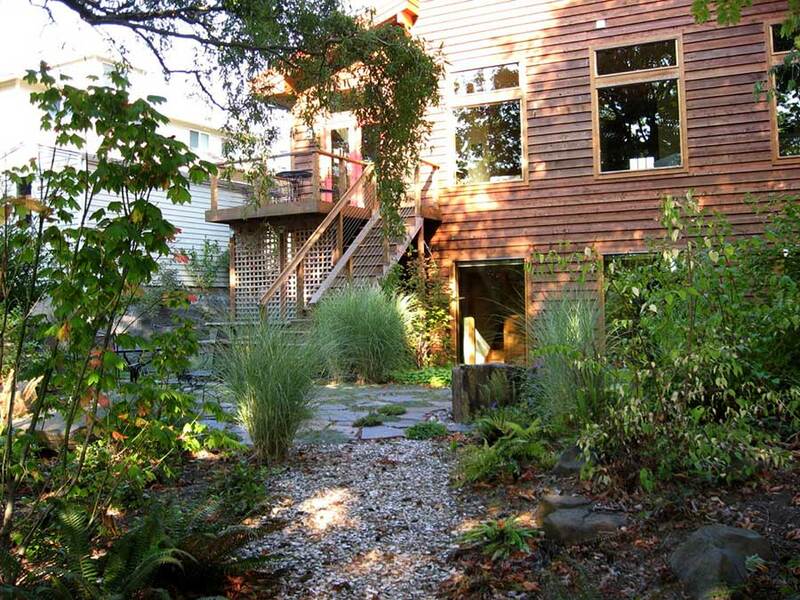 My client had deconstructed her original home, pushed for a LEED building from Lindal, and wanted a garden to match. Unfortunately I was not brought in until February 2009 when the home was in place and the Bobcat access was about to be blocked by the new garage. Decisions had to be made quickly. 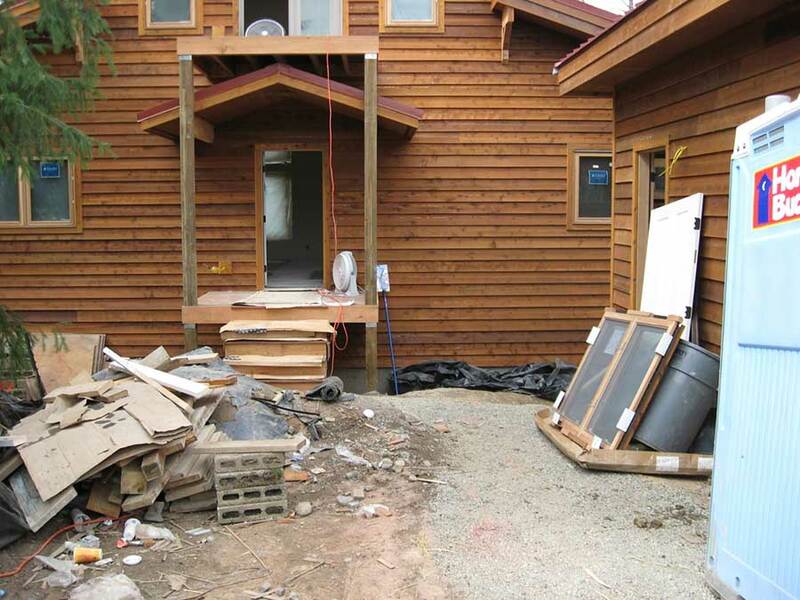 A daylight basement had been added to the house after site planning had been done, leaving 6–8’ cuts in the soil with spring rains on the way. Rockeries had been planned before I was involved, but now there was no way to get equipment in next to the house. Fortunately a geotech engineer had already been involved on the project and was familiar with the site. With him we devised a plan for gravity block walls without standard terracing. Once we had secured the site it was easier to step back and look at paths, connections, and the program in general. For budgetary reasons we opted not to do a cistern system for the rainwater, but did make a small rain garden with the garage roof. We created a dining patio in the back garden. Flagstones connected three large rocks, one for each member of the newly formed family to sun on. 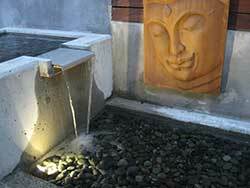 One rock was drilled to become the water feature. JP Landscape Services was responsible for the installation. A tremendous number of trees had been on the site, especially for a city lot. 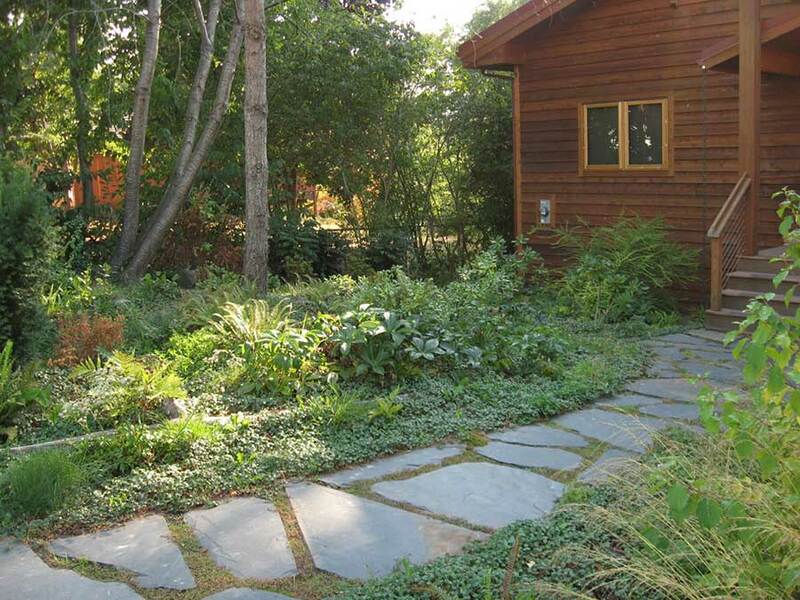 The client wanted to keep as many as possible, so we saved the best, groomed many, and left quite a bit of natural area at the back of the property. The understory was full of invasives and undesirable plants. Most new plants brought in were native, there were a few drought tolerant selections, and a very few “must have” exceptions from the client. I made frequent visits to the site during construction and worked closely with the crew on plant installation. The resulting garden has filled in beautifully, looking very natural despite having been heavily edited. The daylight basement is a yoga studio and used for occasional community meetings. The view out is calming and serene. 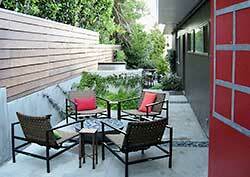 The alley entrance, opens into the outdoor living room. The red door was part of the prior garden project. 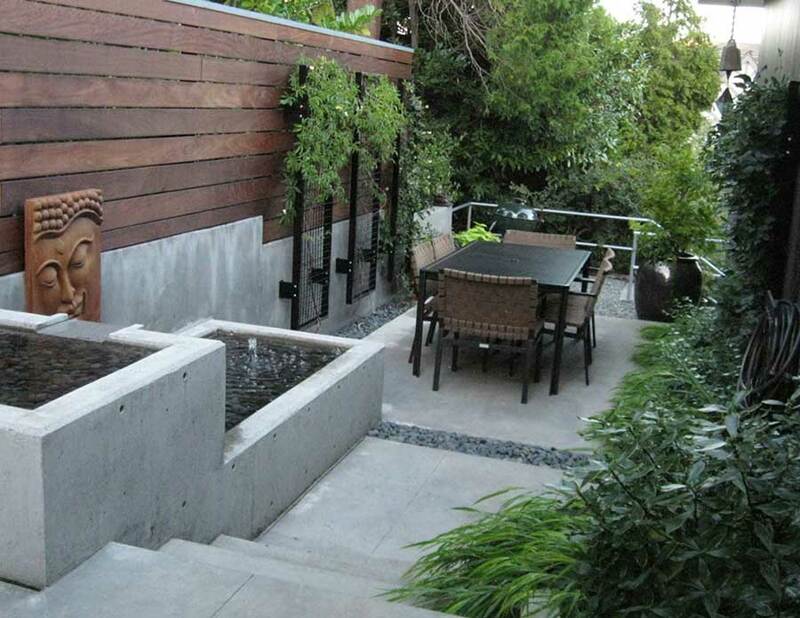 View from kitchen window - the two-tiered water feature takes advantage of the change in grade. The subtle lighting throughout the garden invitingly illuminates the garden room at night. This is the second garden created with these clients, and both were very different. 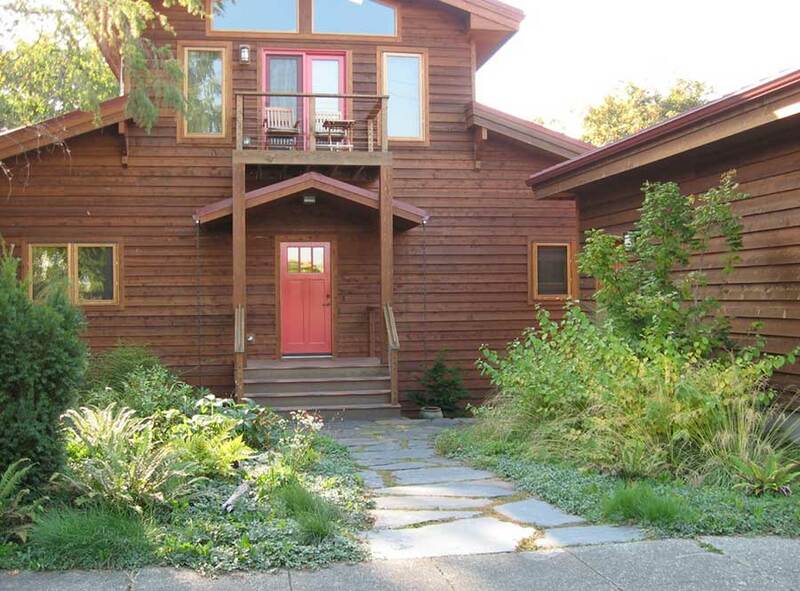 This house had been built in 1954 and stayed in family ownership until purchased by my clients in 2006. They have sought to balance modernization with respecting the original design intent. After a major kitchen renovation it was time to tackle the adjoining garden in 2012. 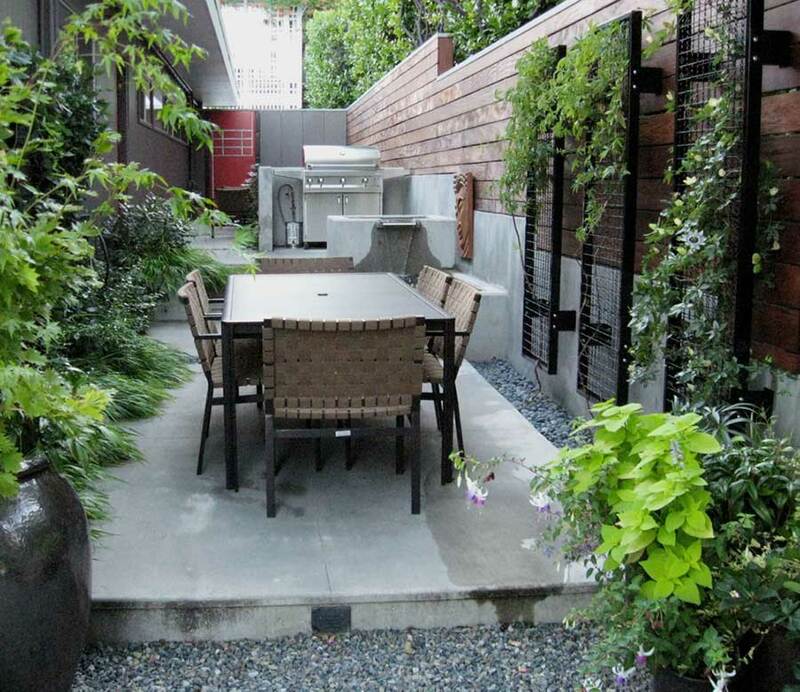 The challenge here was to create room for grilling, lounging, and dining, in a 10x70’ space. 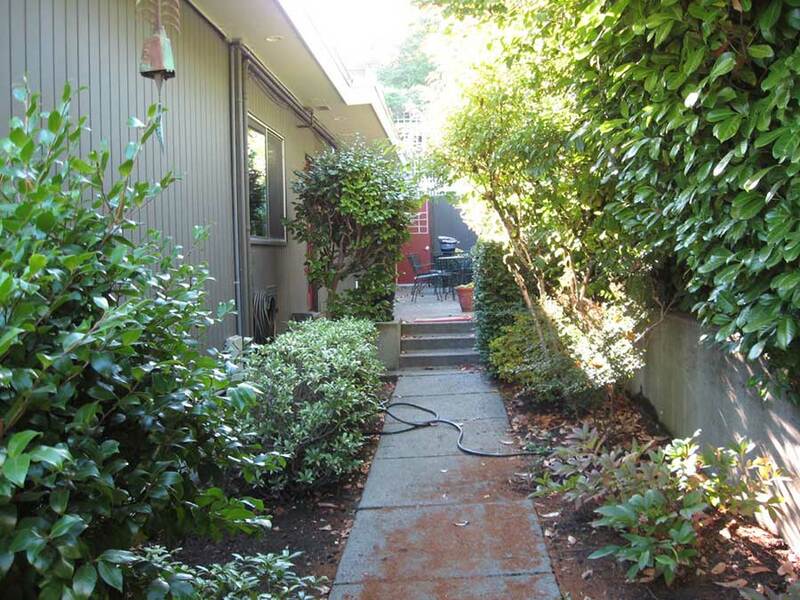 The north side was bounded by an aging 3’ concrete wall topped by the neighbors 8’ English laurel hedge, which had encroached 2’ into the patio. It was an uninviting area that had been unused and avoided. The existing concrete floor was failing and once excavated we found that the downspouts had not been connected to anything, just directing runoff under the patio surface. Proper drainage was installed, and forming was done for new concrete floors, water feature, and grilling station. Then we waited, and waited, for winter rains to allow a pour. Our primary contractor was JW Golding and Associates. 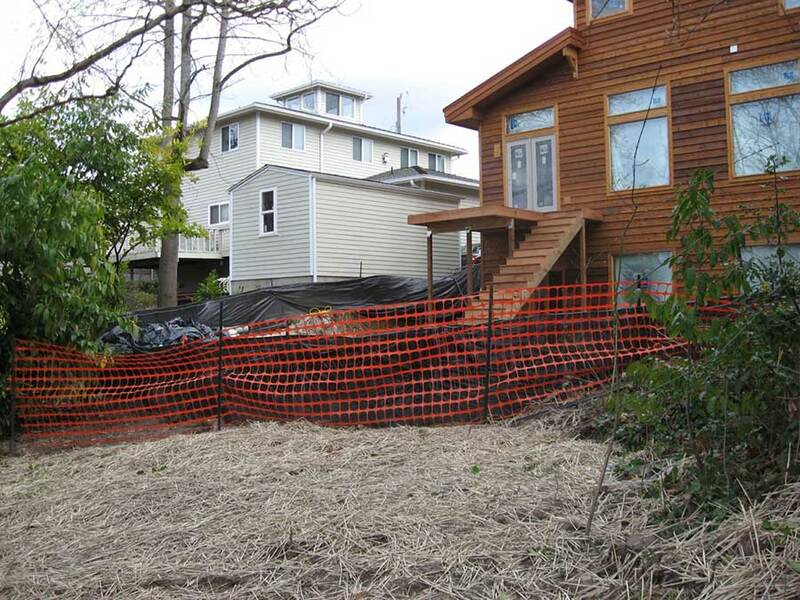 The lot is near the I-90 bridge and the homeowners wanted running water to help mask the traffic sound. We ended up with two water features and the ambience is lovely. A large ceramic pot in a reservoir provides quiet near the master bedroom. A larger two-tiered concrete structure has water flowing from the upper pool over a stainless steel plate to the lower level, which is equipped with a bubbler. This feature is the view from the window at the kitchen sink and prep area (with stainless steel counter). New ipe fence walls were installed for screening and to warm up the space which had reflected green into the house from the mass of laurel. A Paloform concrete gas fire pit was installed, as well as a gas hook-up for the new grill, which sits just outside the kitchen door. 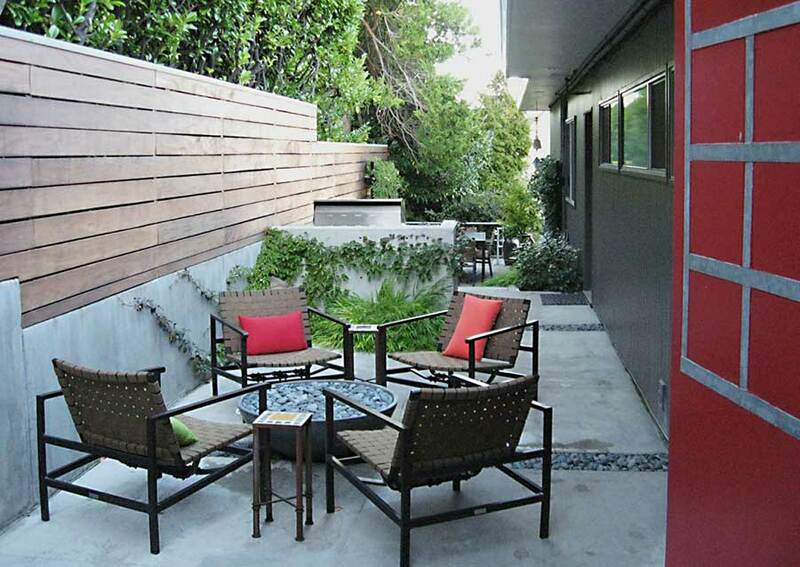 Handsome powder-coated steel trellis panels give us vertical space for vines and help block view of the gas/electrical/phone cables near the dining area. Design lines are simple and decor is spare, with two facial sculptures gracing the space. Large ceramic containers from Aw Pottery were used for planting and water. Our inside joke was that I would bring all the plants in one carload and it was almost true. The plant list includes Hakonechloa macra ‘Aureola’, Sarcococca, Camellia sasanqua ‘Setsugekka’, and Passiflora caerulea ‘Blue Crown’. 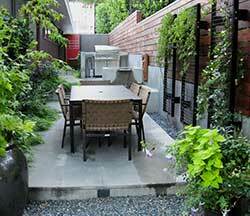 The resulting garden is clean, elegant, and highly to suited to the clients, who feel like they are away on vacation when relaxing on their patio. Virginia's studio and backyard garden. APLD’s certification program confers professional recognition to landscape designers based on established standards of excellence. Currently, 20 percent of APLD members are certified. Certification is available for Professional members in good standing who have been practicing landscape design for a minimum of four years. 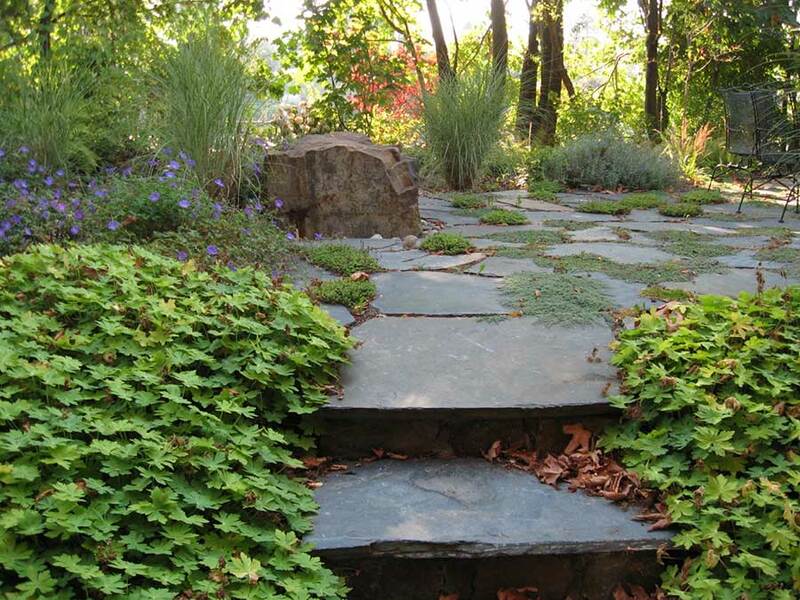 It is the only landscape design certification program in the United States. The certification review process evaluates a candidate’s submitted work, consisting of three installed projects. To maintain certification, Certified Professional Members must continue to develop their skills by completing approved continuing education credits (CEUs). Don't forget to check out the membership categories!